And it shall be for a sign for you upon your hand, and for a memorial between your eyes, that the law of the Lord may be in your mouth; for with a strong hand did the Lord bring you out of Egypt. And it shall be for a sign upon your hand, and as totafot between your eyes; for with a mighty hand did the Lord bring us forth out of Egypt. And you shall bind them as a sign upon your arm, and they shall be as totafot between your eyes. You shall put these words of mine on your heart and on your soul; and you shall tie them for a sign upon your arm, and they shall be as totafot between your eyes. “Tefillin is the postbiblical Hebrew term for two small boxes containing Torah passages written on pieces of parchment, with leather bands attached to the boxes in such a way that one may be worn on the forehead, between the eyes, and the other tied to the arm. Tefillin (from tefillah, prayer) is the name of a small tractate in the Talmud that assembles the relevant prescriptions of tradition. “The Torah demands four times that words of the law be put as signs on the hand and as frontlets (or symbols) between the eyes (or on the forehead). Just what the Torah itself had in mind when these admonitions were set down can no longer be ascertained. They may have implied a demonstrative display similar to that of the mezuzah (with which they are linked in Deut. 6:8-9) or they have been meant figuratively, as was maintained as late as in the Middle Ages by the Rashbam (Rabbi Samuel ben Meir, in his commentary on the Torah.). These commandments, he writes, ‘shall be for you a reminder as if they were written on your hand. They are to be taken [fig] just as in ‘Set me as a seal upon your heart” (Song of Solomon 8:6). At any rate, the custom of writing down some representative laws which could then be worn goes back to ancient days and may be connected with ideas that the wearing would have some prophylactic effect similar to that of amulets, or perhaps would show the wearer’s membership in a sacred community. The Rabbis still had a tradition, however, that made it clear that some regulations pertaining to the tefillin were a post-Torah development, and they held that such rules went back only to the soferim (scribes), that is, to the early teachers of the Oral Law, but no farther. (137)The law says it is proper to lay up justice in one’s heart, and to fasten it as a sign upon one’s head, and as frontlets before one’s eyes, figuratively intimating by the former expression that one ought to commit the precepts of justice, not to one’s ears, which are not trustworthy, for there is no credit due to the ears, but that most important and dominant part, stamping and impressing them on the most excellent of all offerings, a well approved seal; (138) and by the second expression, that is is necessary not only to form proper conceptions of what is right, but also to do what one has decided upon without delay. For the hand is the symbol of actions, to which Moses here commands the people to attach and fasten justice, saying that it shall be a sign, of what indeed he has not expressly stated, because it is not a sign as I conceive of one particular thing, but of many, and I may also say, of everything with which the life of man is concerned. (139)And by the third expression, he implies that justice is discerned everywhere as being close to the eyes. Moreover he says that these things must have a certain motion; not one that shall be light and unsteady, but such as by its agitation may rouse the sight of the spectacle manifest before it; for motion is calculated to attract the sight, inasmuch as it excites and rouses it; of, I might rather say inasmuch as it renders the eyes awake and sleepless. (142)Moreover, he ordains that those who have written out these things should afterwards affix them to every house belonging to a friend, and to the gates which are in their walls; that all people, whether coming in or going out, whether citizens or strangers, reading the writing thus fixed on pillars before the gates, may have an unceasing recollection of all that ought to be said or that ought to be done; and that every one may take care neither to do nor to suffer injury; and that all persons, whether going into their houses or going out of them, men and women, children and servants,may do all that is proper and becoming to one another and to themselves. 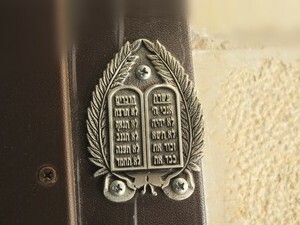 a Karaite Mezuzah, like the Samaritan one, it displays the Decalogue for all to see, however unlike the latter, it is affixed to the doorpost (in Rabbanite fashion), rather than to the lintel. Let every one commemorate before God the benefits which He bestowed upon them at their deliverance out of the land of Egypt, and this twice every day, both when the day begins and when the hour of sleep comes on, gratitude being in its own nature a just thing, and serving not only by way of return for past, but also by way of invitation of future favours. They are also to inscribe the principle blessings they have received from God upon their doors and shew the same remembrance of them upon their arms; as also they are to bear on their forehead and their arm whose wonders which declare the power of God, and his goodwill towards them, that God’s readiness to bless them may appear everywhere conspicious about them. This account differs from Philo’s and it seems as if Josephus is indeed speaking about actual objects. This must have prompted the editor (Whiston) to comment there in a footnote: “whether these phylacteries and other Jewish memorials of the law here mentioned by Josephus, were literally meant by God I much question. The Karaites who keep close to the written law think they were not literally to be understood”. Now whether Whiston questions Josephus’ interpretation or our possibly faulty understanding of this passage is unclear to me. Now it might be a bit of a stretch but in this interpretation (incidentally, the book of Mathew is the only book in the entire New Testament that was originally composed in Hebrew), Jesus might not be referring to phylacteries at all but rather to prayer תפילהם; they lengthened their prayers. At any rate, in the Greek translation, it appears that he is referring to an amulet that the Pharisees tied to their foreheads; no mention of a tefillin of the arm is made. Interestingly enough, see L. Ginsberg, Die Haggadah, pp. vi, 105-6; and the late 9th c. testimony of R. Nahshon, Gaon of the Yeshiva of Sura, who reported that he had before him an ancient fragment of the Talmud that differed from his own version. Whereas his (and our) normative text of Babylonian Talmud Menahot 43B reads “whoever has tefillin on his head and tefillin on his forearms…there is complete presumption that he will not sin”, the ancient fragment reads, “tefilllin on his head and a sefer torah on his arm”. The latter is understood to denote the 10 Commandments. in Commentary on the Whole Bible, by Matthew Henry, volume 1, page 586-587, regarding Exodus 13:9, the latter pointedly comments on the passage in Mathew that “Christ blames the Pharisees, not for wearing them, but for affecting to have them broader than other peoples”. So in summation, it appears the earliest Jewish sources are ambiguous, at best, about tefillin- and none of them speak of a separate hand and head tefillin, as we know them today. Quick recap: Josephus refers to “a remembrance upon the arms” (which as mentioned, may or may not be figurative), Aristeas similarly refers to a “sign around the hand” (same), whereas the NT speaks of the Pharisses “enlarging their Phylacteries to show off to the people”, obviously referring to tefillin of the forehead, this one is almost certainly referring to a physical object, as the Greek word ‘phylakterion’ means amulet. In a Mandaen Source (the exact source is not given there, but it is clearly referring to ‘the story of Miriai’ as recorded in the Mandaean Book of John- j.d.) there is a story about a Jewish women who rejected Judaism and its customs, and one of those customs is referred to as טוטיפתא (totiftha) instead choosing a ‘headband’ or as it’s referred to in the article: a זר רענן . The tefillin as a ‘phylaktrion’, an amulet for self-protection. Similar amulets and talismans abound in the ancient world, including Christians who wrote amulets with verses from the NT, especially popular were those inscribed with the Lord’s Prayer. Muslims would carry tiny copies of the Quran on their person as protection. Even followers of Manichaenism- the followers of Mani, would carry a small scroll containing the biography of their founder Mani. Also interesting to note, that some Jews in the Medieval period ascribed magical powers to the Book of Jonah and would carry tiny scrolls of it for protection. It appears to the ed. that the tangible mitzvah of tefillin was accepted by all Jewish second temple sects. He also cites the Church Father, St. Jerome who mentions this custom among the Jews of his day, in his writings, although Jerome himself understood the verses metaphorically (PL XXVI, col. 168). As mentioned, I don’t think the findings of tefillin at Qumran and at the “Bar Kochba” caves proved that all Jews wore tefillin. One must bear in mind that all these caves housed multiple occupants at various different times. Aside from the ‘amei haaretz’ and the slackers mentioned in Talmudic literature, there are also echoes that this was merely a custom of the ‘hassidim’ and not of the common folk (see for instance Shabbat 118B; Yerushalmi Berakhot 2,3 and 4, p. 3. 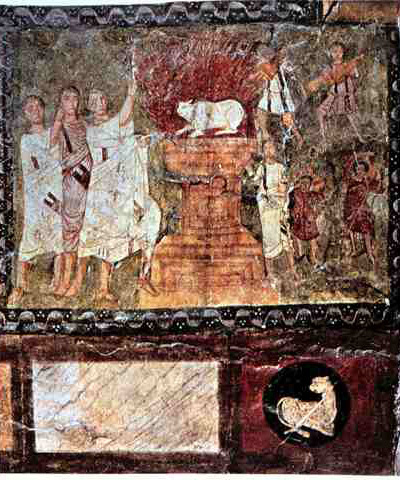 In the ancient paintings at the Dura Europos Synagogue (incidentally founded by a thriving community of Jews with strong connections to the major Jewish population of Babylonia), we see representation of Jews wearing ‘sisit’ but not one of tefillin. Even in the geonic period there is mention of laxity of this commandment, see Saadiah Gaon commentary on shemot parahsat bo, and sefer shibolei haleket, “inyan tefillin”. Even the tosafists call it מצוה זו רפויה בידנו see Shabbat 49A תוס’ ד”ה כאלישא. Did the Ancient Sadduccees Wear Tefillin?, What about the Essenes? According to the Talmud, the Sadduccees would take the commandment of ‘wearing it between the eyes’ literally, and instead of the forehead, they would place their phylacteries on the bridge of their nose. Although we have no corroborating evidence that the Sadducees did in fact wear tefillin at all, it is a matter of great debate. Regarding the Essenes, it appears that they indeed took the commandment literally, as is evident by the archaeological discoveries of tefillin at Qumran (if indeed we accept the most commonly held theory about an essene community on the site), however the possibility that the tefillins found there may have come from Jewish Zealots who later overtook these fortresses cannot be completely discounted. Philo interestingly remarks about the essenes “all ornamental dress they detested”. Nolb also relates another piece of archeological evidence: hundreds of phylacteries found in several of the caves. Nolb denies, however, that these phylacteries could have belonged to those who wrote the sectarian writings in the Dead Sea Scrolls, arguing that the authors of the “Manual of Discipline” interpreted the literal injunctions of the Pentateuch as metaphors, thus it is unlikely that the phylacteries belong to them. In addition to this, the texts on the phylacteries vary and show no distinguishable consistencies. Therefore, Nolb concludes, these phylacteries can have no connection with the sectarians who wrote the scrolls because a sect would have produced phylacteries with some sort of uniformity. “To counter the idolatrous practice of wearing amulets, Hebrew men began wearing phylacteries. There were two kinds of phylacteries: one worn on the forehead between the eyebrows, and one worn on the left arm. The one worn on the forehead was called a frontlet. It had four compartments, each of which contained a piece of parchment”. A very interesting illustration of similarity of the attitude on the part of the Jews and the Greeks towards the Scripture and the books of Homer respectively is avaialable in the ancient Jewish sources. The Jewish rule is that the king must always wear the Scroll of the Torah on his person (see Deut. 17:19), TB Sanhedrin 21B and 22A). remarks to this effect: אותה שיוצאה ונכנסת עמו עושה אותה כמין קמיע ותולה בזרועו “that scroll which is to go in and out with him he shall make in the form of an amulet and fasten it to his arm”. This is exactly what the Roman Emperor Julian reports about his treatment of Homer and Plato (Letters to his uncle Julian, ed. Bidez, No. 80) ” and these (i.e. Homer and Plato) are like amulets and talismans, for they are always fastened one me.” Comp. also Plut. Alex. VIII and the spurious letter ascribed to Julian (Sp.383a, Bidez No. 190). Perhaps an even earlier (Egyptian) Influence? So many Jewish cultic practices come from ancient Egypt that it’s not surprising to see Egyptian monuments showing the Pharaoh wearing a headdress that looks like the tefillin – phylacteries – worn during prayer by observant Jews. In many depictions, Pharaoh is shown wearing a snake crown from which there projects above his brow a sacred asp or viper and a cobra in aggressive attitudes. They represent the Pharaoh’s power of protecting his land by means of serpents that can both defend the land and attack the enemy when necessary. Such powers were essential to the rulers of Egypt, whose rich but extended land was always in danger of invasion from the less fortunate peoples of the surrounding deserts. The deities that supported the Pharaoh also wore appropriate headgear, but in their case not on the brow but further up on the head, above the hairline. In many cases this headgear was in the form of an animal’s head, such as the jackal or the ibis-bird; but in some cases it was just a small black box on a black plate. Was this a form of tefillin? A case in point is the goddess Isis, who stands behind her deceased husband, the Pharaoh Osiris, wearing such a black box on her head, as depicted on the mummy of Kep-ha-eses of the second century BCE in the Copenhagen Glyptotek Museum. Another example comes from the tomb of Anher-Khaou in Thebes, of 1,000 years earlier, where it is again the lady Isis wearing a black, box-like headdress, leading a boat-load of gods that take the deceased to his place in the next world. What was this black box? It has a stepped profile and represents the royal throne of the dead Pharaoh Osiris, who ruled over the next world. Isis, his sister and wife, by wearing this black box, could assist the suppliant to reach the world of everlasting life presided over by Osiris. THE CHILDREN of Israel during their sojourn in Egypt must have been familiar with such depictions, and with the concept of the ruling classes of the country wearing headgear symbolic of their physical and cultic functions. Whether we see these local customs in a positive or negative light, they were representative of the country from which the Israelites were being evacuated. Indeed, a reminder of such customs was to be one purpose of the tefillin, which were to be a “remembrance between your eyes… that with a strong hand the Lord brought you out of Egypt” (Exodus 13:9). However, in another passage the tefillin to be worn on the head are described as totaphot (Deut. 11:18), which is a completely obscure biblical word. Much later, the rabbis of the Mishna take it to mean just an ornament, but the great Rabbi Akiva looks at the origin of the word and derives it from a doubly foreign source. Alluding to the four sections of the head tefillin, he claims it means two and two in the languages of “Katpi” and “Afriki” (Talmud Sanhedrin 4B), which sound like Coptic and Egyptian. In Rabbi Akiva’s view, then, the connection to Egypt is clear. These ancient Egyptian depictions were enough to convince an apparently previously wavering believer that Tefillin are in fact tangible and not metaphorical items. However, all is not simple with this observation either. Isis was a Goddess and herself not a real figure. There are no representation of any of the Pharaohs wearing any such headgear. Moreover, the ‘headgear’ pictured here is a hieroglyph (of a throne)-not a representation of a physical object. ולשומם תחת המעבר, לפרשם בדרך משל על העיון וההתמד בדברי התורה להגותם ולקיימם. מאמר חכמינו עליהם השלום על היות המאמרים הנזכרים משל על המבואר לא על-פי גלויים. The Torah is to be like a fine bracelet or necklace which we are to wear proudly. In other words, the Torah is supposed to be precious to us and be remembered always. It is worth noting that of the four places in the Torah which use this expression 2 of them are telling us to remember the Torah (Dt 6,8-9; Dt 11,18) while the other two are commanding us to remember the Exodus from Egypt (Ex 13,9; Ex 13,16). It should be noted that the Karaites also interpret the verse “And you shall write them on the doorposts of your houses and your gates” (Dt 5,9; Dt 11,20) to be a metaphor equivalent to “write them upon the tablet of your heart.” (Prv 3,3) and not as referring to the Rabbanite Mezuzah. Also interesting to note that the Karaite author Eliyahu Bashyatzi, while taking the standard Karaite view, explains that the verse “and you shall bind them as a sign upon your hand” is a reference to the Ten Commandments “for there are ten fingers on the hand” (see Aderet Eliyahu, 106d). The anonymous (or not so anonymous, for those who are familiar with the colorful Rabbi Leone Da Modena) author of the ‘heretical’ tract Kol Sakhal likewise assailed tefillin, setting forth a hypothesis of its late origins. Among other things he notes that nowhere the Torah’s numerous descriptions of garb is there any description of a person wearing tefillin. Kol Sakhal also cites the absence of Rabbinic consensus on the proper order of the scrolls as an implicit sign that the practice in question is not ancient: “for if they had a tradition, how did the disputes arise?….How is it that Rashi and Rabbenu Tam did not know the order of the chapters of tefillin? because they had never seen a pair from their ancestors!”. French and Spanish Jewry were particularly lax in this commandment. Rabbi Moses of Coucy states “in the year 126 I was in Spain to reprove them…and there was a wholesale repentance and thousands and tens of thousands began to don tefillin and so it was in other lands, and afterwards my admonitions were accepted in all other places” (Sefer Mitzvot Gadol, positive commandment, 3). 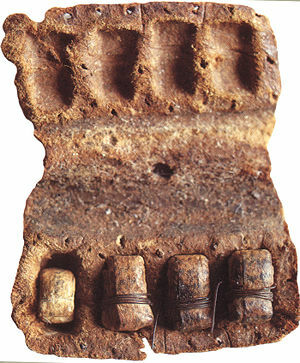 Also see Ibid ‘esin’ 23 about tefillin found from the tomb of Ezekiel which corresponded to Rashi and Maimonides. The historian Salo Baron claimed that the earliest Western European Jewish communities (particularly France) did not use tefillin or mezuzot. He says that this was due to their isolation from the main centers of world Jewry at the time, which may be true but it may also point to the preservation of an ancient tradition (not unlike the Samaritans) that took the verses to be metaphoric. Among the many objects discovered at the famed Cairo Geniza, were conically shaped tefillin, tefillin overlaid with gold, tefillin with the decalogue included etc. השומרונים אינם מניחים תפילין פיזית בשל הטענה כי הנחת התפילין המצווה בספר דברים היא במובן הרוחני. This, I believe is a modern-day myth, possibly for the purposes of drumming up Jewish tourism (which has increased tenfold over the last years). According to an acquaintance of mine who recently visited the Samaritans at Nablus, the priest at Gerizim claimed that their mesorah (tradition) for tefillin has been lost. According to this account, the story was that the Samaritan would wear their tefillin all day and therefore provided an easy target for their persecutors, so eventually they gave up/lost the custom. The myth as recounted to me makes even less sense considering that the word tefillin indicates that it was only used during prayer (although I am aware of the custom already mentioned in the Talmud of wearing them all day long). Although I should point out that the Samaritan ‘tallit’, while very similar to the Jewish one, does not contain ritual fringes. Some Samaritans claim that the tradition of making sisit was lost (others however believe that the ‘fringes’ must come from the garment itself and therefore the Rabbinic interpretation, here too, is mistaken) However, as mentioned before, this has not been the case for Mezuza..
Wow! You’ve really outdone yourself with this post. What a treasure-trove! See Bechor Shor on the allegorical nature of mezuza and kisui haDam amongst much of French Jewry. Menachem Ben Saruq gives the word טטפות an allegorical meaning, derived from the shoresh טף – to speak, as in (והטף אל דרום” (יחזקאל כא ב”. Rashi brings this explanation as well. [this has no effect on the understanding of the mitzva, whether tangible or allegorical, but it serves as a precedent to the Rasbam. The Kol Sachal’s argument is not truly a good one. I myself have worn tefillin every day since my Bar Mitzva but have never seen the scrolls inside. Tefillin are hermetically sealed, so ‘seeing’ them wouldn’t guarantee that one would know what the order of the scrolls are, hence the machlokes between Rashi and Rabbeinu Tam. Yet, the halacha mandates that it be opened and checked frequently (how frequently is a machloket….). My safrut teacher argued that it’s best never to open them unless it’s obvious that something physical has changed. They are presumed kosher as long as they’re closed, and opening them can damage them. The Kol Sakhal’s argument (it is one among several), it definitely not a very good one, indeed. I think he mostly brings it to mock the early Rabbinic sources that talk about hillel and shammai displaying the tefillin of their ancestors. במכילתא בא סו”פ י”ז שמאי הזקן אומר אלו תפילין של בית אבי אמא..
הרא”ש מביא את שניהם אבל אולי השני לא נמצא בירושלמי שלנו? I did not have a chance to check the Yerushalmi, did you not find it in your edition? Apparently, I have come to learn recently that references to the Yerushalmi found in much of medieval Ashkenazi literature is not to our Yerushalmi, but rather to a composite ‘Yerushalmi’ that incorporated a variety of gaonic traditions. See Aptowizer’s Sefer Ravyah, vol. 1, p. 263, n. 10. His discussion of this composite text may be found in his Mavo ha-Ravyah, p. 275-277. Thank you Zohar for your kind words and your very intriguing reference. I will be sure to look it up. Deuteronomy 6:9, Numbers 12:8 I forgot to mention that he also discusses what is closest to home here, tefillin. This is *the* source for France! I’ll check it tomorrow. רב תודות ידידי היקר! Like this article… Though the alleged teffilin of Isis seems like a weak link to me… It was all the vogue to claim that so many of much of the Bible was influenced by Egyptian culture… As you cited in your article – she was wearing the shape of a throne on her head! Interestingly enough, he does not speak of sisit at all! They could be for Kohanim only. Also see Onqelos: kruspedin. unusual. “fringes” in Greek. At any rate it’s clearly an apologetic step aimed at decreasing Rabbinic harrassment and making Rabbanites feel more comfortable with Qaraites. The latter reasoning is behind the presence of at least 2 Rabbinic Mezuzot affixed to doorposts in the Jerusalemite synagogue. 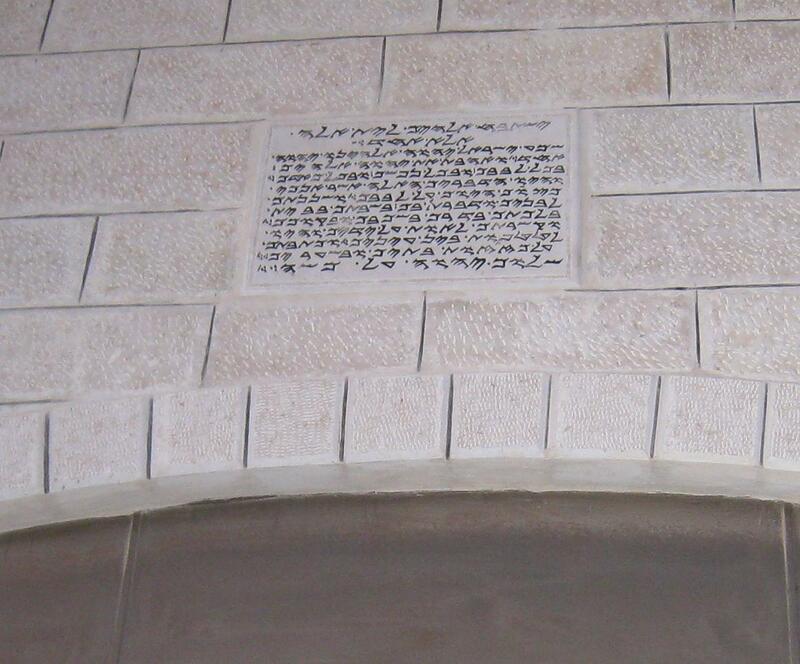 There are additional versions of the Qaraite Mezuzah that present the full text of `Aseret haDevarim printed on paper. If that was indeed the official Karaite position then at least they are consistent; taking the entire verse to be metaphorical. Not so with the Samaritans, who have long maintained the commandment of Mezuzah but interpret the verses about ‘tefillin’ metaphorically. How did they know to make this distinction? mesorah? What gives? Your misappropriation of the Jewish term “חידוש” to describe a non-Jewish practice that has no root in or acceptance by the traditional Jewish community highlights just how un-Jewish, indeed counter-Jewish, Karaism is. Jewish religious law is applied based on the Jewish community’s acknowledged leaders’ rulings based on the tradition from Sinai. The leaders do not always agree, and when one accepted Jewish religious scholar introduces to the others a new angle to weigh a matter within the context of a religious ruling, that introduction is called “חידוש”. It is only a valid חידוש, only worthy of anyone’s consideration, if it comes from a preeminent scholar, an exemplary practitioner, of the tradition from Sinai. Moreover, in order to be valid, a חידוש must fit with, not clash with, the tradition from Sinai. Since Karaites do not study or practice the Jewish tradition, to the extent they even desire to contribute to Jewish religious discourse, their input has never warranted serious consideration from the Jewish community. Similarly, it’s no חידוש that Jesus was the messiah, or that Muhammad is G-d’s prophet, or that the Easter bunny hides painted eggs. These are made up beliefs, like the Karaite conception of a doorpost, that are at odds with the Jews’ tradition from Sinai. Why did you conceal your name? Afraid of your identity getting exposed? It is plainly obvious that you did not allow the unfavorable facts in the article above, which evidently refute your statements (a case in point being the fundamental inconsistency in the makeup and design of the Tefillin since their beginning in the 1st or 2nd century AD), to confuse you in the least. Your comment constitutes nothing but a laughable anti-Qaraite Jewish rant by a fanatic Orthodox obscurantist hater. I feel sorry for you. Reading your rant, an individual of an IQ below room temperature might take away the impression that you hold Islam to be more Jewish than Qaraite Judaism. Not only was the “oral” Torah’s first part invented by the Pharisees, starting from the early 2nd century BCE, but the “oral” Torah’s so-called Chain of Transmission (as broached by Rambam) suffers from several gaps between some supposed transmitters e.g. (1) at least a few years passed between the death of Pinḥas b. El`azar and the priest `Eli”s birth; (2) a few decades elapsed between the death of Aḥiyah the Shilonite and Eliyahu haNavi’s birth; (3) a few decades passed between Barukh b. Neriyahu’s death in Egypt to the birth of `Ezrah the Scribe in Babylon; (4) more than 50 years elapsed between `Ezrah’s death and Shim`on haṢadiq’s birth. It follows that the supposed, ahistorical Chain of Transmission was fabricated by some rabbi/s and this is one of the proofs that the “oral” Torah was a Rabbinic creation. Furthermore, impartial scholarly research (a ballpark you are not in and want no part of) betrays the influence that Qaraite exegetes and thought had upon Rabbinic Judaism, primarily in the former half of the Middle Ages. The Cairo Genizah has been instrumental in enabling this influence to be noticed and studied. But hey … those Orthodox Rabbanites bent on hating the Qaraites and their form of Judaism are not content with the older persecution and banishing of the Qaraites from shared communal life; they are set on attempting to ensure that the Qaraites will be banned from ever again contributing to the overall Jewish religious discourse, and thus the Orthodox haters can gleefully complain that no Qaraite contribution is being made. You have a vaunted auto-antisemitic heritage to be proud of. Irrespective of how much you dislike it, Orthodox discourse and Halakha do not have a monopoly over the term חידוש, which has more than the single meaning you attribute to it. In point of fact, many Qaraite Jews have studied Rabbinic writings and works since Qaraite Judaism’s appearance on history’s stage. Many still do. Additionally, impartial scholarly research (a ballpark you are not in and want no part of) betrays the influence that Qaraite exegetes and thought had upon Rabbinic Judaism, primarily in the former half of the Middle Ages. The Cairo Genizah has been instrumental in enabling this influence to be noticed and studied. But hey … those Orthodox Rabbanites bent on hating the Qaraites and their form of Judaism are not content with the older persecution and banishing of the Qaraites from shared communal life; they are set on attempting to ensure that the Qaraites will be barred from ever again contributing to the overall Jewish religious discourse, and thus the Orthodox haters can gleefully complain that no Qaraite contribution is being made. Furthermore, it is plainly obvious that you did not allow the unfavorable facts in the article above, which evidently refute your statements (a case in point being the fundamental inconsistency in the makeup and design of the Tefillin since their beginning in the 1st or 2nd century AD), to confuse you in the least. Your comment constitutes a laughable anti Qaraite-Jewish rant by a fanatic obscurantist Orthodox hater. Reading it, an individual of an IQ below room temperature might take away the impression that you hold Islam to be more Jewish than Qaraite Judaism. You have a vaunted auto-antisemitic heritage to be proud of. I feel sorry for you. As I’ve shown from Philo and Jopsephus,among others, it is undoubtedly of ancient Israelite origin. That is if the latter 3 words pertain to the 2nd half of the Second Temple era. None of the claims made by the Pharisees, Philo and Josephus constitute evidence that the practice of writing Torah verses on doorposts and/or lintels of doors and city gates traces back even to the former half of the Second Temple era let alone earlier periods, just as Aristeas Letter’s testimony concerning the supposed early version of Jewish tefillin can’t prove a Rabbinic argument that tefillin were used among Israelites in `Ezra the priest’s time and earlier. it’s far from clear that philo and aristeas are familiar with tefillin practice at all. they might simply be paraphrasing the septuagint – josephus’ text does seem to show that he knows of a practice. While the above three authors apparently don’t always agree on everything, their work represents the most up-to-date state of research on the topic and are a “must read”. I just discovered your blog..fascinating Post. The Egyptian Museum in Cairo also has a few items that look almost the same as present day tfillin , perhaps a tad smaller, kind of reminded me of the old pairs that were around in America in the early 20th century.There are also numerous artifacts there that have uncanny resemblances to many of the items described and/or proscribed in the Torah. My point is that your attempts to re-write various aspects of Jewish history, while voluminous, are at odds with the academy. Historians gather all of the available evidence, and deduce from it what happened based on its relative strength. You, on the other hand, postulate a series of alternative historical theories that have no serious evidentiary support and that in fact clash with the strongest evidence available. 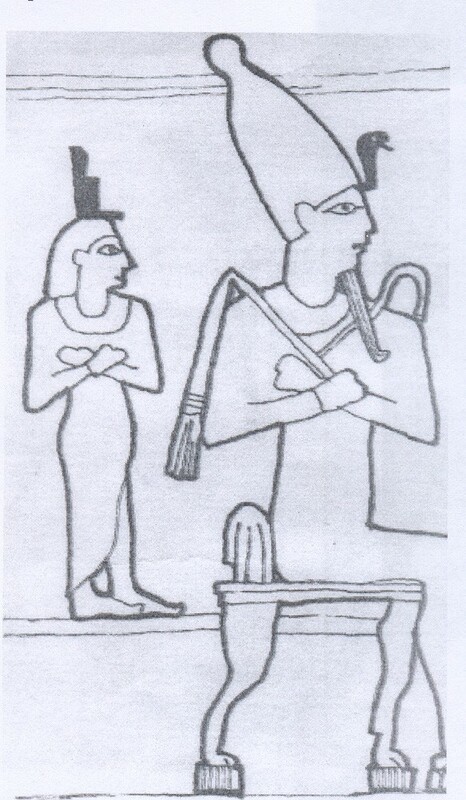 For instance, historians look at ancient drawings of Egyptians in stylized hats and indeed with animal heads and a complete absence in the Egyptian record of any phylactery usage and conclude that there is zero relationship between the Jewish phylactery tradition from Sinai and ancient non-Jewish customs among the Egyptians. But you don’t let the facts get in the way of your headlong rush to to re-wire phylacteries from their Sinaitic tradition to ancient Egyptian gentiles. That’s okay if you want to believe it and write about it, but it just isn’t an example of the pursuit of academic truth in the field of history. You ignore the genesis of Karaism, namely a rejection of the Jewish tradition from Sinai, in an ahistoric bid to paint Karaites as having a tradition from Sinai that only a written document was received there from G-d; Karaites have no support for their rejectionist outlook. To the extent we define them by their beliefs as rejectionists of Judaism, it is illogical to append “Judaism” to their Karaite moniker. Your attempt in that arena is akin to labeling a robber a “criminal policeman”. But a crook is the opposite of a policeman, rather than one legitimate type of a cop. Wow your passion and zeal for truth really shines through in your comments (and here I’m actually not being cynical). Firstly, the reason, I did not respond to your comment earlier, was because I simply did not have a chance to do so, so please excuse the long delayed response. Having said that, let me attempt a frank and honest response to the points you have raised. My point was that your attempts to re-write various aspects of Jewish history, while voluminous, are at odds with the academy. Historians gather all of the available evidence, and deduce from it what happened based on its relative strength. You, on the other hand, postulate a series of alternative historical theories that have no serious evidentiary support and that in fact clash with the strongest evidence available. I beg to differ sir. I make no attempt here, or anywhere else for that matter, to re-write any aspect of Jewish history or practice. What I have done here is simply gather all ‘available evidence’ as you put it. If Josephus, Philo and Aristeas don’t meet your standards of ‘historical evidence’ than what exactly does? This pseudo-historian approach (with an “o” instead of an “a” to, I presume, take on an Israeli air) is common to your other entries here. You ignore the genesis of Karaism, namely a rejection of the Jewish tradition from Sinai, in an ahistoric bid to paint Karaites as having a tradition from Sinai that only a written document was received there from G-d; Karaites have no support for their rejectionist outlook. To the extent we define them by their beliefs as rejectionists of Judaism, it is illogical to append “Judaism” to their Karaite moniker. Your attempt in that arena is akin to labeling a robber a “criminal policeman”. But a crook is the opposite of a policeman, rather than one legitimate type of a cop. My point, which was apparently lost in a failed attempt at sarcasm, was simply to encourage you to hew to the available evidence and the rigors of academic history work: strive for truth! My writings are my own, I do not claim to be an expert in any field (incidentally the “o” in “historion” reflects my identity as a proud Israeli Jew, in fact you are welcome to visit me anytime in Jerusalem, where you can often find me at Hebrew University, Givat Ram Library…). I hardly ignore the genesis of Karaism, as you put it. In fact I have read a great deal and continually do so, regarding said genesis. With the trickle of publications based on unpublished documents from such important resources as the Firkovich Collection in St. Petersburg and others, there is much yet to be learned about their origins and history. What I do know for certain is that much myth and legend, has been attached to the karaite brand (especially by their detractors-who were/are numerous). What I strive to be is an objective scholar. I will not get into a theological argument with you, because that’s not the purpose of my blog. Believe in what you wish, but if you want to be a true objective scholar, you will not let your beliefs cloud your judgment of the facts. And yes, what I have presented here, is plain, simple, naked facts. I’m afraid that what you’ve written amounts to plain, simple, naked theology. Your starting point is your belief that Jews, who claim to be practicing a tradition that dates back to Sinai, are not. The fact of the matter is that we have one huge clue before us as to why those who don phylacteries do so. We have the testimony of the phylactery wearers themselves about what was passed down to them by their ancestors, and their testimony is unanimous that it derives from a Sinaitic tradition. Among those who wear phylacteries, there is no extant traditional narrative agreeing to your doctrinal position that King David never wore phylacteries; the Karaite tradition does not date to Sinai, but to a point in time at which Karaites parted company with the Jews by rejecting the Sinai tradition. As such, your conclusion about the source of phylacteries is opposite the facts rather than consistent with them. Sadly, the standards of the academy do not elevate an ethnicity claim above a sound argument that aligns with known truths about the preponderance of the evidence. You’re of course free to believe in your chosen faith, but let’s not call it “history” when it is in fact the opposite of historical research and analysis in a pursuit of objective truth. FYI: “can you find me one scholar who believes that tefillin (as we know it today) is Sinaitic?” Yes–R’ Ovadiah Yosef. 1). As usual you are evading the point I was making; you stated before that Karaites and Jews are two distinct entities Well, you can’t have it both ways; if you believe Rabbi Yosef is a great Torah scholar, then Karaites are as Jewish as me and you (whether they practice a proper form of Judaism is of course a different question). So what’s it gonna be, Mr. Anonymous? 2). When I asked you to quote competent scholars, I added the caveat ‘in the field’. Rabbi Yosef is a giant in Torah scholarship-of that, there is no doubt- but he is no archaeologist or historian. But it seems that you are just trying to avoid the issue, rather than have a serious dialogue. I’m afraid that what you’ve written amounts to plain, simple, naked theology. Oh, theology is it? and what exactly in my piece reflects that? Did I imply that Jews should stop wearing tefillin because it is not Sinaitic? Did I say that the tefillin tradition is inauthentic? Maybe you should read it again (and the sequel which I am preparing -and thank you for encouraging me to finish it) and realize that what I have done here is simply present to the reader, all the earliest historical evidence that we have in front of us regarding said tradition. It seems to me that you have already drawn your conclusions; in your mind I am a heretic who seeks to undermine ‘authentic Judaism’, when in fact I believe that all Jewish traditions, sinaitic or not, have an an important place in our rich tradition. We have the testimony of the phylactery wearers themselves about what was passed down to them by their ancestors, and their testimony is unanimous that it derives from a Sinaitic tradition. Are you re-quoting the Yerushalmi that I posted in my article and does not in fact exist in our extant versions? the Karaite tradition does not date to Sinai, but to a point in time at which Karaites parted company with the Jews by rejecting the Sinai tradition. And where exactly did I write, or even imply, that it dates back to Sinai? You know, as well as I do that the Rabbinic tradition, just like its sectarian counterparts (as reflected in the large corpus of Rabbinic works), is hardly unanimous on many issues. There is no neat set of Halakhot from Sinai, other than those found in the Masoretic Bible. Rambam tried to change that with his Mishneh Torah and paid a heavy price for his troubles. Yes, there is a unanimous consensus in Halakha that tefillin (more accurately: the intricacies of its construction) is הלכה למשה מסיני, but (1). is it exactly like the tefillin we know today? and if so why are there disagreement on the arrangements of the scrolls, among other things? (2). A halakhic consensus that a certain commandment is halakha lemoshe misinai, does not preclude the right (perhaps even obligation) of every individual to dig into the origin of said commandment and present all available evidence thereof. Sadly, the standards of the academy do not elevate an ethnicity claim above a sound argument that aligns with known truths about the preponderance of the evidence. Huh? an ethnicity claim? pray tell, whatever do you mean by that? (and by the way, apparently you consider yourself a greater Torah scholar than R’ Ovadiah Yosef who ruled that Karaites are in fact יהודים לכל דבר) The Academy? Sound argument? I have yet to see one from your end. Go ahead, quote me competent scholars in the field who disagree! I eagerly await your response. I wouldn’t say that. You’re wrestling with the question of from where phylacteries originate, but you’re doing so while purposefully, intentionally and unjustifiably dismissing the strongest available hint: the claim by all phylactery users throughout documented history everywhere that Jews wear them only because G-d told their forefathers to do so at Sinai. That doesn’t make you a heretic or a danger; it makes you a poor historian and a devout believer in your own personal religious dogma. I am sorry to break it to you, but that makes 99.9% of historians out there, incompetent in their chosen field, but of course you know better…. Your contention is nothing more than a variation of the ‘national revelation’ argument, popularized by people like Lawrence Keleman and other kiruvists. It might work on a macro level, but I am afraid it comes up short on the micro level; on the details of Jewish law and lore. I have proposed to you several questions (none of which you addressed, of course), one of which was: if there is a continuous unbroken chain of tradition for every law from Sinai, from whence arises the myriad of disagreement on just about every detail of halakha? Why are there at least three different opinions as to how the parshiot should be arranged within the the tefillin box? on how big the box needs to be, if black straps are HLM, etc. etc. (and this in the Rabbinic/Perushi tradition, never mind the Sadduccee, Essene and other sectarian variations). There is much more to say about that, on various other halakhot, but we’ll stick with tefillin for now, since you still haven’t addressed any of the issues I posed to you on the subject. I’m sorry if I’ve missed a series of serious questions that you’d posed to me. But I do see your question about the mechanics of the transmission of the tradition from Sinai through the generations. You deserve to have that curiosity addressed, and this forum is far too limiting in scope for me to do it justice. Let me direct you to an answer, though: take The Oral Law, by H. Chaim Schimmel, out of the library. Incidentally, the “national revelation” narrative isn’t actually a Kelemen invention–it’s “new to you” because he did you the favor of expounding it English. Surprisingly it’s the age-old, essential logical framework that has guaranteed the Jewish tradition’s continuity by demonstrating to successive generations that their forefathers’ claims are credible. And as a further aside, given your acknowledgement that this “argument” works “on a macro level” (whatever that means), given the existence of a tradition that is uniformly attested everywhere and at every time phylactery wearers could be found, why are you so insanely focused on what modern day archaeologists, who have zero connection to the phylactery tradition, have to say about the origins of phylacteries? Oh, I didn’t say that “99.9% of historians out there [are] incompetent”. We were discussing your history scholarship, only. Real historians draw logical conclusions based on the evidence, not obviously mistaken conclusions than clash with it. Trying to explain phylacteries without regard to the Sinaitic phylactery tradition common to all phylactery wearers is about as academically sound as trying to explain television while denying Western civilization has harnessed electricity. I do not consider myself an expert in the field needed here – at best, I may contribute something to the question of “totafoth”, but even that – with extreme caution. I can’t help comparing “totafoth” with “kokhav”, for example. It is generally accepted that “kokhav” is the Hebrew parallel to the Akkadian “kabkabu” meaning “star” (Arabic “kabkab” means either “a group of people” or “splendor”, which might be related), having undergone phonetic change from kabkab > kawkab > kokab > kokhav. This may indicate that “totafoth” was originally “taftafoth” (becoming “tawtafoth and then “totafoth”). What could “taftafoth” indicate? Perhaps “small objects”, like Hebrew taf (with a Teth) = children. I don’t believe I can anything else useful. Parchment wasn’t invented until about the fifth century BCE. Did all phylactery wearers throughout history miraculously suffer the exact same misunderstanding of their forebears’ transmittal to them of the phylactery tradition from Sinai? Do you believe in miracles? Alternatively, in which generation do you assert all Jews conspired to pass on to their progeny that they had all received a phylactery tradition dating to Sinai from their ancestors? Clearly your conspiracy theory would have had to have unfolded after the time of King David, since you insist he’d never heard of phylacteries. So when do you believe the mass communal conspiracy that best explains modern phylactery use and beliefs was actually perpetrated? Philo the Hellenist is a relatively recent source for criticism of Judaism, not an early source for information about it! The earliest Jewish source for phylacteries is the tradition from Sinai. Tradition is not a source. Rabbinic tradition only dates from the late 2nd Temple period. The rabbis merely backdated it to Sinai in order to endow it with Mosaic and, thus, divine authority. No other Jewish sect knew anything about such traditions, which is why its advent was so controversial, even enduring into the New Testament. 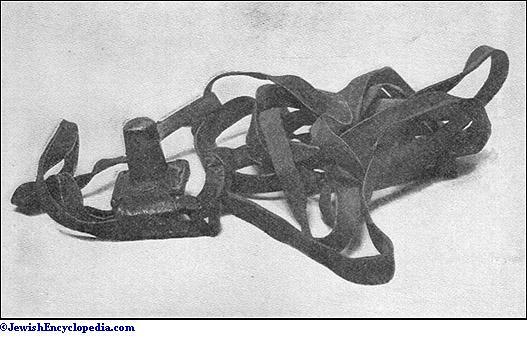 Tefillin was a sectarian Jewish practice, not in force amongst the Jewish mainstream. Anyway, Mr Anonymous, how about you presenting some proof for rabbinic tradition? It’s very easy to give others the third degree. It’s about time Orthodoxy substantiated its claims. I have yet to be convinced that God prescribed us to strap boxes of scripture to our heads and arms when, as late as the rishonim era, they still couldn’t agree on the details. If the alleged tradition from Sinai was so reliable, how could it fall down on so fundamental a practice? Answer: because neither the tradition nor the practice date from Sinai. The rabbis made it all up! Period. Hey, who’s been posting all of these notes in my name!? This is a really magnificent post. Keep them coming! Thanks Alex. I am looking forward to reading some of your own great insights here and elsewhere. Someone recently told me my tefillin are too low (this happens to me a lot- I blame my receding hairline- my tefillin are exactly where they’ve always been since they were slightly loosened when I was 13, perhaps a tad lower after a haircut, unless they’ve stretched), telling me that Karaites wear them between their eyes. I had to restrain myself from pointing out that Karaites don’t wear tefillin, although I’ve seen pictures of (perhaps uneducated) Jews wearing them that low. Interesting article. I would point out that even today, the head tefillin is the more prominent as the arm tefillin is often worn under the shirt. This is supported by later halakhah that has one expose the head tefillin and hide the arm tefillin (or according to the SA, one can cover the arm tefillin). I’m also surprised you didn’t reference the king’s wearing of the Torah upon his arm, which seems to be a precedent or accompanying near proof that the Torah does have a concept of “wearing” passages of Torah on the body. Of course, this too, can be taken metaphorically, as in always having the Torah on hand, but the sages did hold that he wore a sefer Torah on his arm. But I DID abundantly reference the King’s ‘tefillin’. There were MANY practices of MTsRYM(egypt)that were odopted by the children of Yishraal who OFTEN transgressed the directives of Yahuah, hence the worshipping idols.there are MANY jewish traditions which have ABSOLUTLY NO place in scripture nor truth of true Yishraalite practice but arejust yet another thing jewish rabbis claim as to be true because they “Said so”, or the talmud claims so, and the talmud often adds to the commands and laws even though it contradicts our mighty one telling us that we DO NOT ADD nor SUBTRACT from His laws. I have found no one else comment on it, but in one of the Dura Europos paintings showing Moses and the crossing of the red sea it appears to me that one of the Moses figures has the straps of the hand tefillin on his right hand -and even more striking the hands of God are depicted and the right hand appears to have the straps of the hand tefillin. In the same picture it rather looks to me as if Moses (on the right) is wearing a head covering. Eloquent and informative, though of all the cultures that have had some form of symbol or amulet, it’s curious that they are all gone. Yet Benei Israel continues. Maybe if they had not forgotten the ancient wisdoms or superstitions they would still be here today.